GOV.UK frontend styles include loads of small, elegant details that make them worth including in your service – even if it looks nothing like GOV.UK. I even use them in my personal website. Of course, none of these details are hard to create, but re-creating all of them would take a fair while. 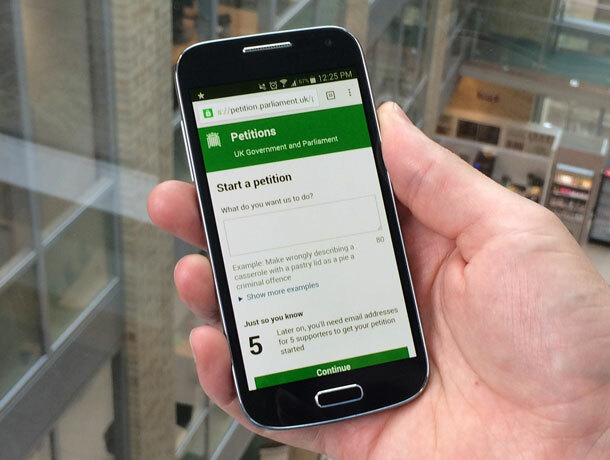 We recently launched petition.parliament.uk. Even though this service isn’t part of GOV.UK, we decided to use a lot of the frontend code and design patterns from GOV.UK. Here’s how we did it. To start, we grabbed the html from govuk_template and the scss includes from govuk_frontend_toolkit, govuk_template and govuk_elements. We used the html to make our main application template, and imported all the scss includes into our main scss file. Then we commented out everything except the stuff from govuk_frontend_toolkit (scss comments don’t compile into the final css file). govuk_template and govuk_frontend_toolkit are both available in a bunch of packages – for rails, node, liquid, mustache, all kinds of things. You don’t want any of these packages – just copy across the scss files directly. We need the freedom to make changes. At this point, site.scss should compile to a totally blank css file. govuk_frontend_toolkit is only scss – you have to call those mixins to use them. If your service isn’t part of GOV.UK, you’ll need to change the font stack. To change the font stack, edit _font_stack.scss. 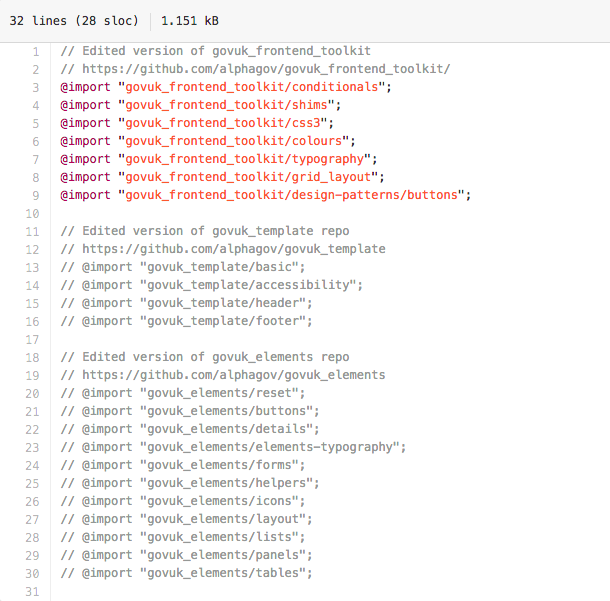 Start with govuk_template, then move on to govuk_elements. 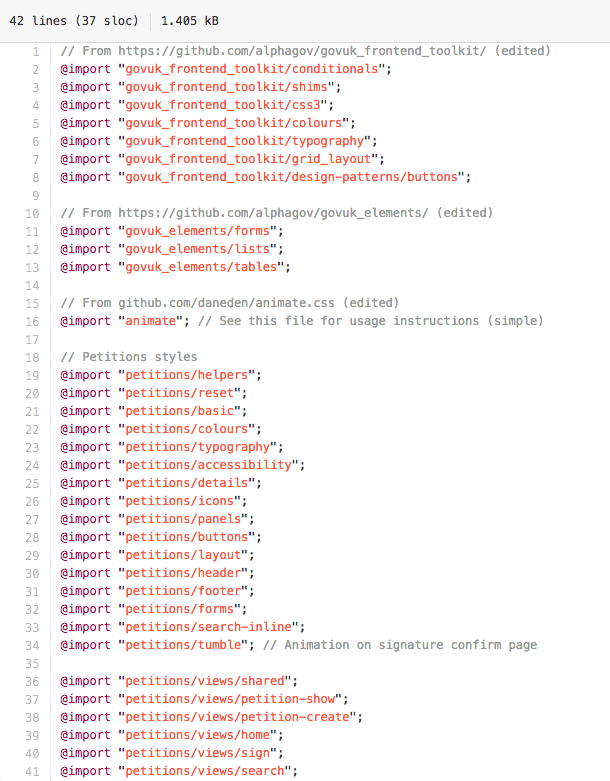 The styles in govuk_elements build on the styles in govuk_template. Use the styles as they are – to do this, simply un-comment the @import. We chose to import the includes for forms, lists and tables straight from govuk_elements. Pick and choose what to use – make a new include for your project. Then copy and paste the bits you need across. This is what we did most of the time. Leave it out – either delete it entirely or just leave it commented out – scss comments aren’t compiled into the final css.